Author of the Amazon bestselling ARKANE series and the non-fiction bestseller Career Change. For three years running, Joanna’s site, www.TheCreativePenn.com has been voted one of the Top 10 Blogs for Writers, and is listed as one of the Top 10 sites for self-publishers. Joanna is a full-time author, professional speaker and digital entrepreneur, who spent 13 years as a business IT consultant in large corporates across the globe before becoming a full-time author-entrepreneur in 2011. “Amazing, amazing talk by @thecreativepenn at LBF – real actionable advice for authors." publishing developments at key global events. These include: TOC New York, the Frankfurt Book Fair, Bologna Book Fair, Editech Milan, British Council Crossing the River conferences in Beijing, Shanghai and Hong Kong, Electric Bookshop Edinburgh, FutureBook Innovation Workshop, London Art Book Fair and Alphaville at Whitechapel Gallery. 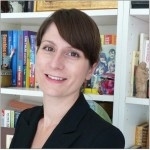 She is a visiting lecturer at the London College of Communications MA in Publishing and at UEA’s MA in Creative Writing. In 2011, Sophie was part of a working group at NESTA looking at the impact of digital on SME Publishing Group, and she was a judge for the New Media Writing Prize. She is currently a Trustee for the Arvon Foundation and is on the Advisory Committee for World Book Night. The Literary Platform is an organisation and a magazine website looking at the crossover of books and technology. Founded in 2009, it has since worked with the Royal Society of Literature, the National Literacy Trust, Random House, Pan Macmillan, Faber and Simon & Schuster on digital projects.